Happy Friday! 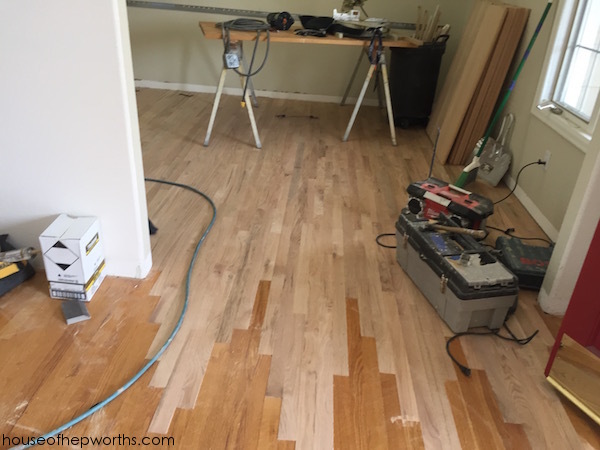 Today is the post you’ve all been waiting for – the floor post. Well, the first one anyway. 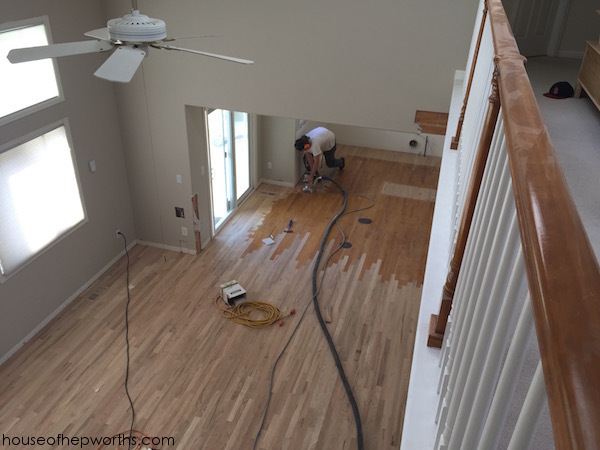 There are so many pictures and so many steps in refinishing existing hardwood floors that I’m going to break it up into several posts. Last I left off, we had finally finished gutting the entire first floor. 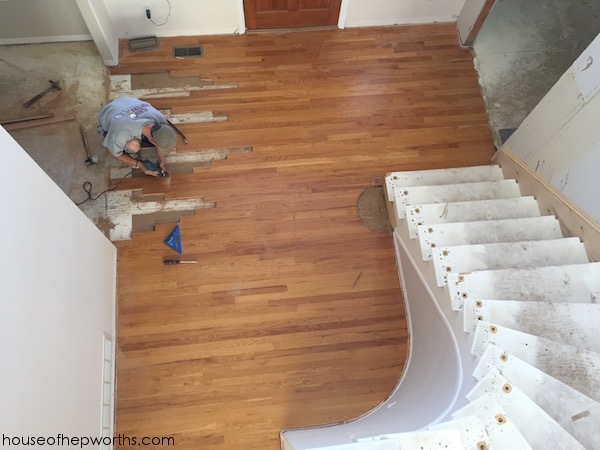 We did so much work to get from point A (the house before we started the renovations) to point B (ready to start on the floors). If you are new to this series I encourage you to start here and read all the progress to get to where we are now – ready to start the floors. So here we are. Day zero. The floor day. The day where we feel like we are FINALLY starting on our renovation. Yes, we’ve done loads of work until now, but that was all tear-down. Today we get to see the house begin to come together. 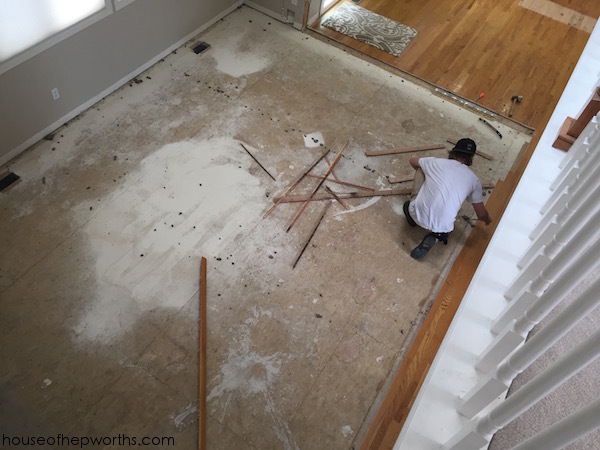 When we very first began talks with the flooring company we hired to do our renovation, I pulled one small baseboard to see if the existing floors went under the baseboard or up to the baseboard. 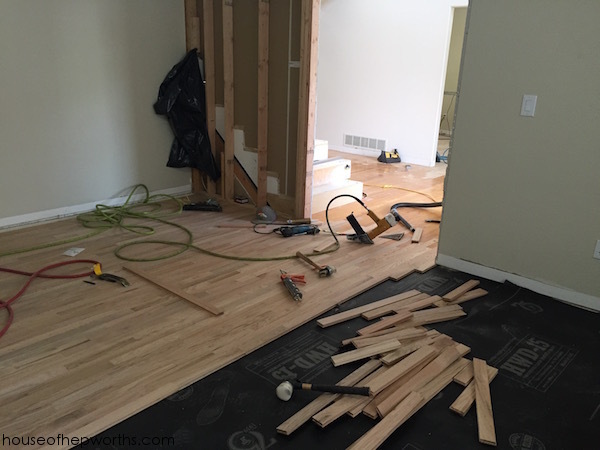 This was a pivotal moment because if the floors went up to the baseboards it would affect if I could put in new different baseboards as well as if we would need quarter round again. Not sure you know this about me or not, but I have a serious whole-body disdain for quarter round. Like, the thought of it gives me a full body negative physical reaction. Am I being dramatic? Of course. But I just loathe it that much. Why do I loathe it that much? I HAVE NO IDEA. It is really dumb. For me to draw my line in the sand with quarter round, to make this my hill I’m willing to die on? Some things you just can’t explain. But seriously, I hate the stuff. SO ANYWAY, I pulled a section of baseboard and to my complete and sheer delight, the floor went UNDER the baseboard. I CAN EASILY ADD NEW PRETTIER BASEBOARDS AND omfg NO QUARTER ROUND when the floors are done. Top 5 best moments of my life. After that moment of pure unadulterated joy, we hired a flooring company. 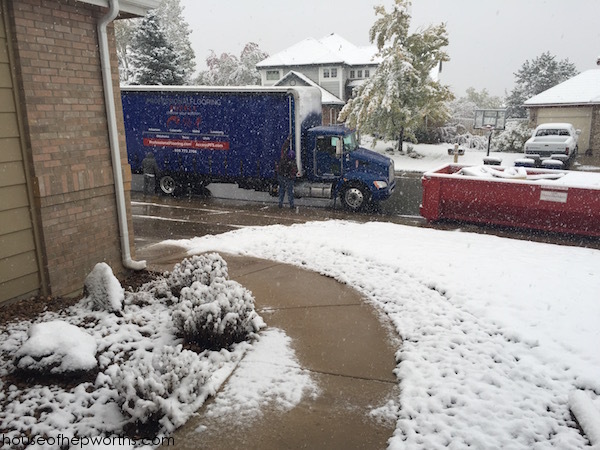 I interviewed the top three in the area and chose the company that best fit our needs. I’m not going to out them on the internet for a few reasons. 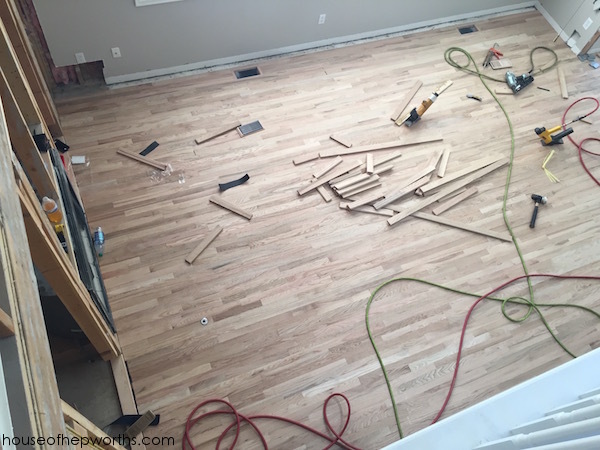 One, they are a local company and 99.9% of my readers can’t benefit from hiring them, and two, we had some hiccups along the way, but in the end the flooring company made it right and the floors are great, so I don’t want to throw them under the bus. But I will show you the issues we had in case you ever get your floors refinished. 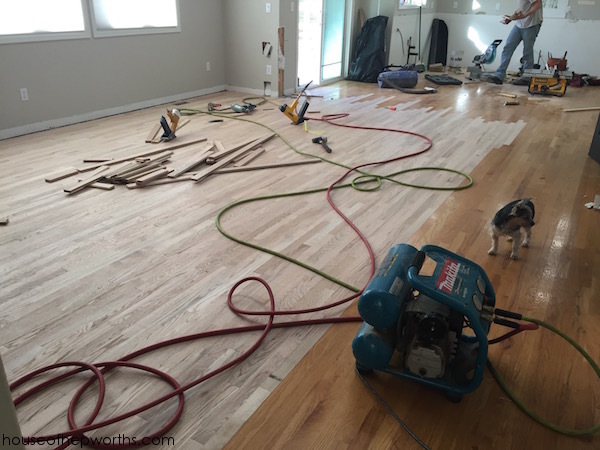 They delivered the floors over a week in advance so it the wood floors could sit and acclimate to our house climate. 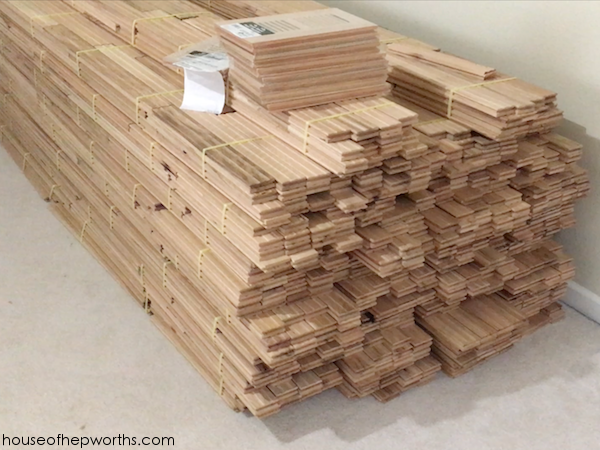 We got red oak solely because it is the type of floor we already have. 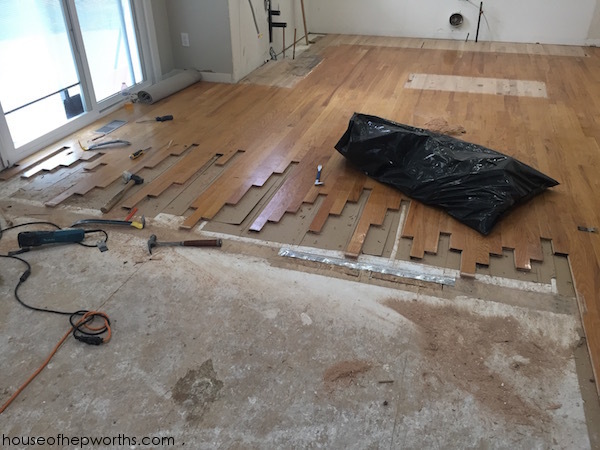 We are weaving in new floor with the old floor so it had to be the exact same type of flooring. We have three large rooms that previously had carpet; family room, dining room, and formal living room (aka board game room). 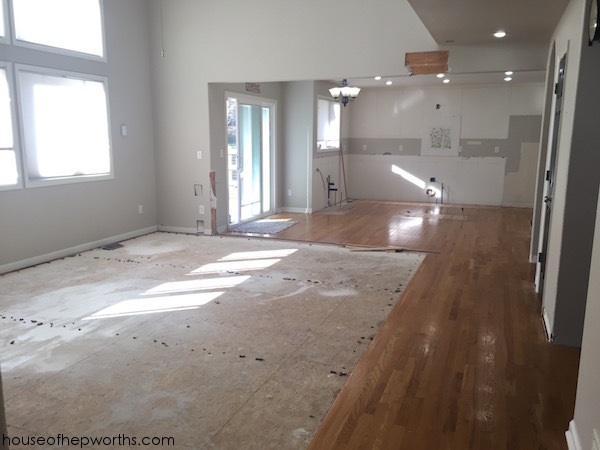 After the carpet and pad was removed the crew started the prep work to weave in new flooring with the existing flooring. Here’s our foyer, ready to begin. You can see the new wall we built on the right (we are adding french doors into the formal living room (board game room). 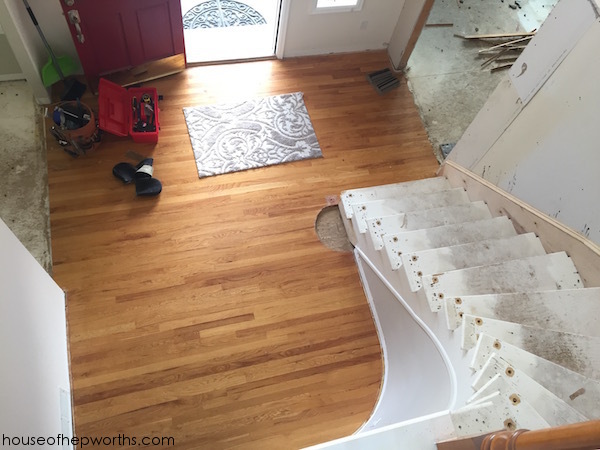 You can also see where we cut out bump part on the bottom step. Back to the family room… This area was the most work and the area I took the most pictures of. They peeled back the old floor all the way to each seam to create a weaved pattern. This way they can weave the new wood into the old so it looks like it was always that way and not a patch job. 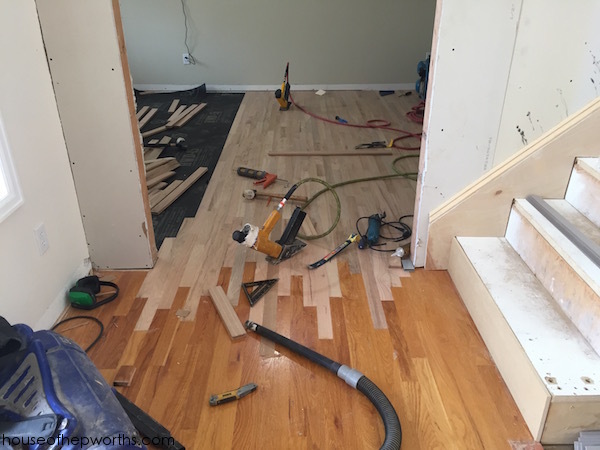 Here’s a close up of the way they cut back the flooring. 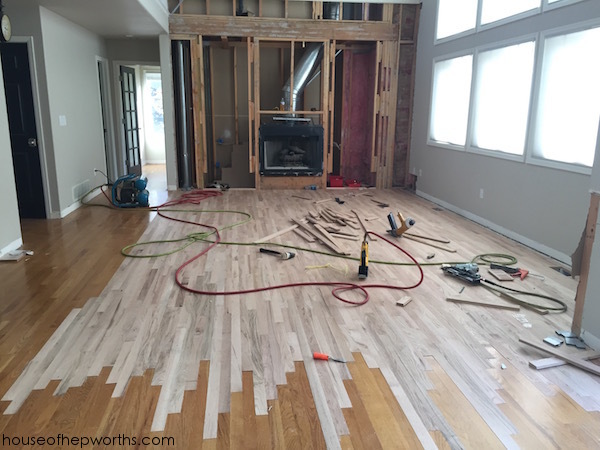 I found it fascinating, yet nerve-racking to watch them cut up my original floor. 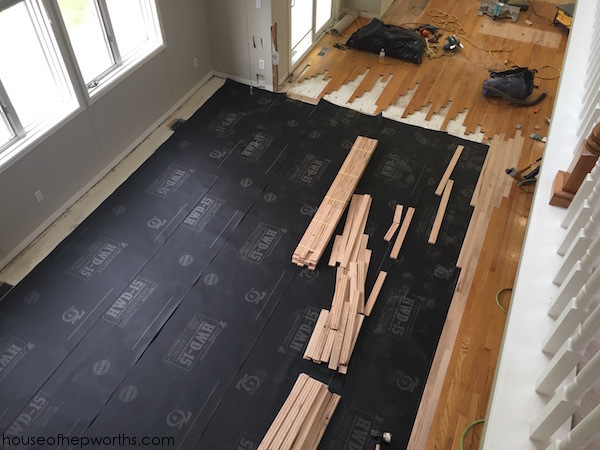 After rolling out some black underlayment paper, they began the process of adding the new flooring. 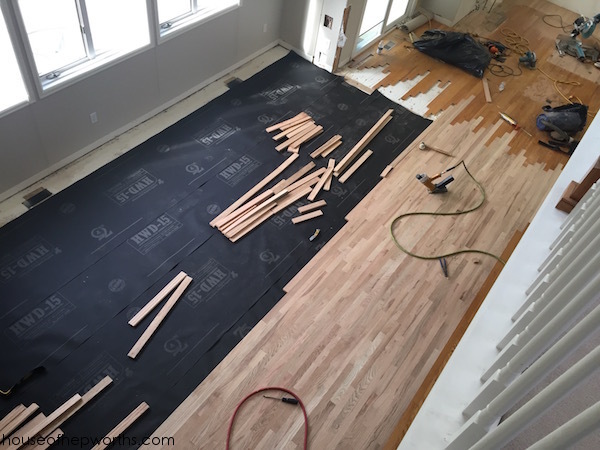 Two guys worked for several solid days to weave in all this new floor (remember, we were adding flooring to three separate rooms and each room had to be weaved in). Progress! My heart is seriously pitter-pattering. The family room is mostly done. 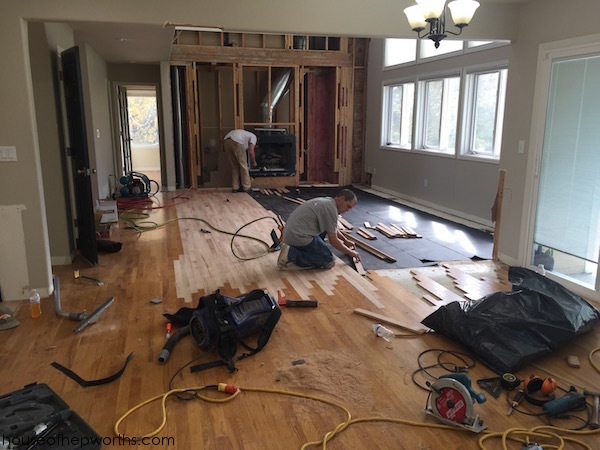 Having the entire first floor with seamless flooring will make the areas look so much bigger. Now they begin on the foyer. Same process for both of the adjoining rooms. It is amazing to me how they peel back the old floor and weave in the new. Once everything is sanded down it will look seamless. Here’s inside the board game room. 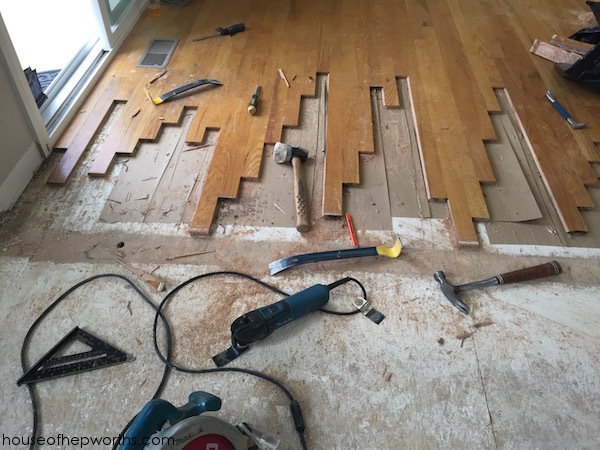 They have to start in the center because they are weaving into the original floor and each plank has to line up perfectly. To read this entire series, start HERE. ME TOO, ME TOO, ME TOO!!! I HATE quarter round!!! Ugh! the hard floors through my kitchen and dining room have stuff. I hate those floors. Quarter round looks sloppy, is too much work to keep clean, keeps you from pushing furniture anywhere near the wall, and, in our case, is PARTICLE BOARD. Hate. There are lots of good reasons to hate the stuff, haha! Why would anyone ever use it? The reasoning defies me. Okay, so I get that *sometimes* you might need it, if you redo your floors and they don’t go under the baseboards. Then maybe. But I still hate it. 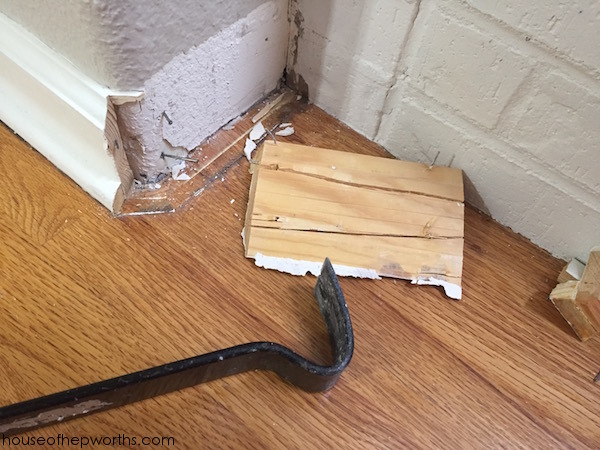 BUT seriously, it has been used SO MUCH that now normal people think it’s normal and opt for quarter round or even worse, brand new baseboards with a faux quarter round already carved into the baseboard. Whenever I see it, I literally think, “whoever put in your floors was lazy and didn’t do them right so they added quarter round”. I’m sure that’s not always true, but it’s just one of those things that annoys the heck out of me! Exactly what goes through my mind too! It looks like a short-cut, crappy-job cover-up. …and that’s what it IS on MY floors, haha! It’s such a pain to keep all those extra edges and corners clean, AND ugly!, so I reeeeeally don’t get why people want it on a quality job! 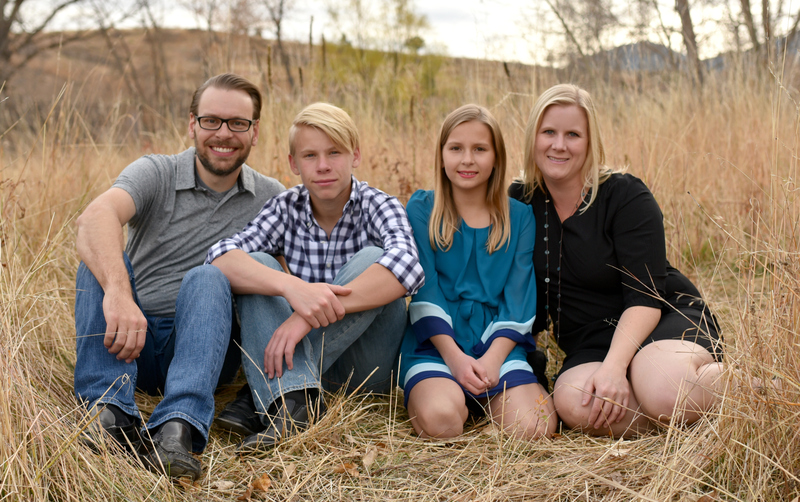 My son is a newish tiler and he and I are befuddled at the cheap-junk choices new house builders are making (remodels I can maybe understand…sometimes?). Maybe some of it is decision overload? Still…! I think it’s just a way to save on cost – buy cheaper stuff. Well, maybe between you and me we can bring quality back! ha! Right here with you on hating quarter-round! I don’t know what it is either, but I just don’t like the way it looks. At all. We should start a club! The stuff gives me hives.